This summer Eliane Pinillos braved dehydration and sickness to scale the Great Wall of China looking for the perfect scene to paint. Today, her art is on display in the Graham Center. 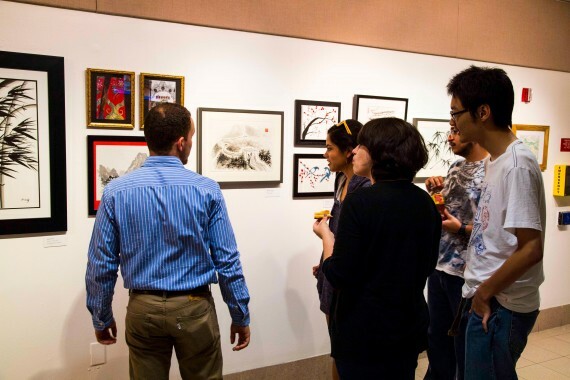 This week, the Graham Center Art Gallery houses more than 35 paintings and drawings from study abroad students. They will be on display until Nov. 21. Pinillos, a speech pathology major, was among two groups of students who participated in David Chang’s summer study abroad programs, one in France, the other in China. Chang is a professor in the College of Education and director of art education. For Chang, the most important aspect of the trip is for his students to learn why artists like Monet and Van Gogh painted, rather than how to paint like them. He brings the students to Monet’s home and the Great Wall of China so they can feel their surroundings instead of “just taking a picture in front of the Eiffel Tower” as he puts it. Daniella Martinez met Pinillos during the study abroad to France last year. Both came away from the experience knowing they wanted to go to China this year. China presented a completely different culture from France, from the United States and from Martinez’s native Colombia. It was modern, fast-paced and, she found, impersonal. “Everyone just kind of wants to go where they want to go and that’s it,” Martinez said of the constant movement and quick interactions, which contrasts with the generally slower-paced lifestyle she knows in Colombia. . .